Known for its unique culture and society, Japan`s rapidly ageing society and chronic labour shortages have created long-term structural challenges. While Japanese policy-makers, pundits, and scholars have debated whether or not Japan could address these issues through outsourcing and automation, in recent years, the rising costs of social programs combined with a shrinking economy have threatened to turn Japan`s ageing population into a national crisis. In December of 2018, Prime Minister Shinzo Abe`s Liberal Democratic Party made history by introducing major reforms to Japan`s strict immigration policy that will dramatically increase that country`s immigrant population. 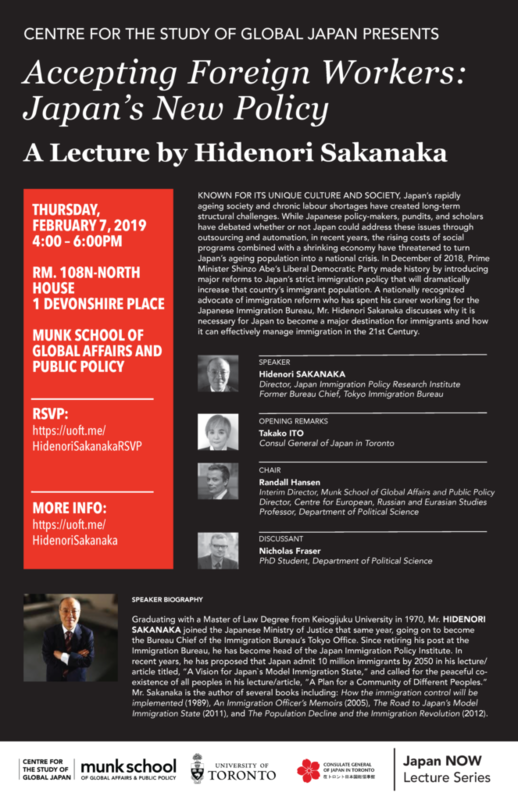 Having spent his career working for the Japanese Immigration Bureau and a nationally recognized advocate of immigration reform, Mr. Hidenori Sakanaka discusses why it is necessary for Japan to become a major destination for immigrants and how it can effectively manage immigration in the 21st Century. Graduating with a Master of Law Degree from Keio Gijuku University in 1970, Mr. Sakanaka joined the Japanese Ministry of Justice that same year, going on to become the Bureau Chief of the Immigration Bureau`s Tokyo Office. Since retiring his post at the Immigration Bureau, he has become head of the Japan Immigration Policy Institute. In recent years, he has proposed that Japan admit 10 million immigrants by 2050 in his lecture/article titled, “A Vision for Japan`s Model Immigration State,” and called for the peaceful co-existence of all peoples in his lecture/article, “A Plan for a Community of Different Peoples.” Mr. Sakanaka is the author of several books including: How the immigration control will be implemented (1989), An Immigration Officer`s Memoirs (2005), The Road to Japan`s Model Immigration State (2011), and The Population Decline and the Immigration Revolution (2012).